Biography & Genealogy: Gaylord Blair Clark, Class of 1867: New Market Cadet; Private, Co. D. Genealogy: Born- April 16, 1846, in Mobile, Ala. Father- Francis Barnard Clark; Mother- Helen Mary Shepherd. Pat. Grandfather- Willis Fish Clark; Pat. Grandmother- Charity Barnard. Mat. Grandfather- James Shepherd; Mat. Grandmother- (first name unknown) Verdier. Married- Lettice Lee Smith, April 15, 1881. Children- 1st: Gaylord Blair Clark, Jr.; 2nd: Gaylord Lee Clark; 3rd: Lettice Lee. Career: Lawyer. 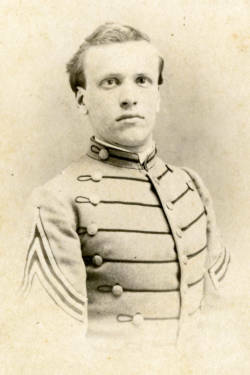 VMI Record: Matriculated on August 26, 1863 from Mobile, AL. Graduated on July 4, 1867. Died- June 14, 1893, buried in Magnolia Cemetery, Mobile, Ala.